230(18 Aug 1944), 231, 234(AS), 235, 236, 237, 238, 243, 244, 250, 251, 252, 253, 264, 255, 258, 260, 261, 262, 263, 266(LC), 268(LC), 271(DLC), 273(DLC), 274(DLC), 278(DLC), 285(DLC), 288, 289(DLC), 290 (24 Dec 1944). (AS) Credited Abortive Sortie, No bombs dropped -- (LC) Lead Crew -- (DLC) Deputy Lead Crew. For Mission dates, targets and Mission Reports, see Combat Missions. 1Lt Milton C. Butler (P) - Mission 230 clew as CoPilot with the 1Lt Norment Foley Crew. Flew as CoPilot on two lead crew missions (266, 268). Flew as a Deputy Lead Crew Pilot on six missions (271, 273, 274, 278, 285, 289). Thirty mission combat tour completed on 24 Dec 1944. 1Lt Brook H. "Hap" Lovell (CP) - Flew as the 1Lt Butler Crew CoPilot on 23 mission - 231, 234(AS), 235, 236, 237, 238, 243, 244, 250, 251, 252, 253, 254, 255, 260, 262, 263, 271(DLC), 272(DLC), 274(DLC), 288, 289(DLC), 290. Flew as Co Pilot with other Pilots on 5 missions - 249, 258, 261, 266, 278. Flew as a Tail-Gunner Observer on 1 Lead Crew mission - 298A. Upgraded from CoPilot to Pilot and flew on 6 missions as first Pilot- 276, 277, 285, 294, 296, 297. Completed a 35 mission combat tour on 6 Jan 1945. 2Lt John E. Holden (N) - Flew as the 1Lt Butler Crew Navigator on 8 missions - 234(AS), 235, 236, 237, 238, 243, 244. Flew on mission 249 on 2 Oct 1944 as Navigator with another Pilot which was his last combat mission. Substitute Navigators used on 21 1Lt Butler missions. 2Lt Maurice G. Hackler (B) - Flew on 26 of the 1Lt Butler missions (All except for missions 230, 263, 266(LC), 268(LC). Flew with other Pilots on 9 missions - 249, 257, 259, 265, 266, 269, 298(LC), 301(LC), 304. Completed his 35 mission combat tour on 20 Jan 1945. T/Sgt Harry G. Bird (E) - Flew on 28 of the 1Lt Butler missions (All except for missions 230 & 268). Flew on three 1Lt Lovell First Pilot missions (277, 294, 296) and on four missions with other Pilots - 249, 257, 295, 297 Completed 35 mission combat tour on 20 Jan 1945. T/Sgt Donald R. Christ (R)(KIA) - Flew on 27 of the 1Lt Butler missions (All except for missions 230, 266, 268). Flew on three 1Lt Lovell First Pilot missions (277, 294, 296) and on three missions with other Pilots (249, 257, 305). Killed in Action on mission 305 on 21 Jan 1945 to Aschaffenburg, Germany with Lead Crew 1Lt Richard D. Duffield (P) in B-17G #44-8137 (No name) following a mid-air collision with B-17G 42-97058 Scorchy II. 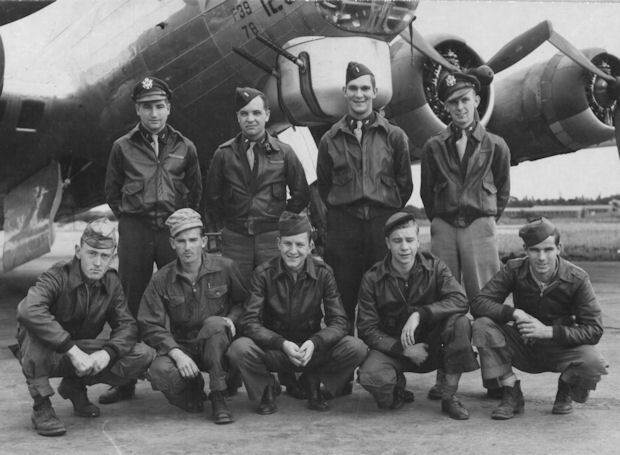 Eighteen crewmen were KIA and two crewmen became POWs in the two B-17s that crashed near Rottweil, Germany. T/Sgt Christ was on his 33rd combat mission. S/Sgt Donald E. Miller (BTG) - Flew on 21 of the 1Lt Butler missions (all except for missions 230, 231, 260, 266, 268, 271, 273, 289, 290. Flew on four of the 1Lt Lovell First Pilot missions (277, 294, 296, 297) and on ten missions with other Pilots ( 249, 257, 266, 298, 299, 300, 301, 303, 304, 308. Completed 35 mission combat tour on 28 Jan 1945. Sgt Robert E. Peterson (WG) - Flew on 23 of the 1Lt Butler missions (all except for missions 230, 254, 255, 258, 260, 268(LC), 271(DLC). Flew on two of the 1Lt Lovell First Pilot missions (277, 294) and on five missions with other Pilots (249, 293, 298(LC), 299, 300). Combat tour completed on 10 Jan 1945. S/Sgt David T. Johnson (TG) - Flew on 26 of the 1Lt Butler missions (all except for missions 230, 266(LC), 268(LC), 285(DLC). Flew on four of the 1Lt Lovell First Pilot missions (277, 294, 296, 297) and on five credited missions with other Pilots (249, 257, 298A, 298B, 299(A), 300). Completed 35 mission combat tour on 11 Jan 1945.